The United States is warmer than at any other time in its history. That’s increasing our bouts of severe weather, eroding our coastlines, and posing greater risks to human health and well-being. And things are likely to get worse before they get better. 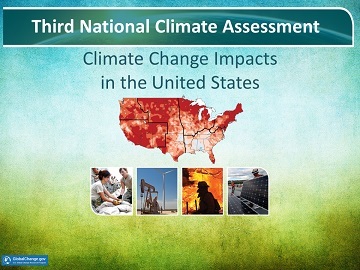 Those are among the conclusions of the third National Climate Assessment – a detailed look at how our climate is changing, how that change is impacting our daily lives, and what we can do to minimize the damage. It was compiled over the last four years by 240 scientists and engineers, and released in May of 2014. The assessment is required by the Global Change Research Act of 1990, which sets up ways to “assist the nation and the world to understand, assess, predict, and respond to human-induced and natural processes of global change.” Among other things, the act established a research and assessment program. It’s administered by the White House Office of Science and Technology Policy, and includes 13 federal agencies. It’s required to present a report every four years. This year’s report was compiled by experts from federal, state, and local governments, as well as academia, industry, and non-profit groups. They considered evidence collected across the country and around the world, and compared the numbers to predictions made by different climate models. The report concluded that climate change is not only real and caused by humans, but it’s likely to accelerate – creating a lot more problems in the decades ahead.